Description: M-241 is an inhibitor for protection of aluminum and it’s alloys from “in can” corrosion and also waterbased coolants, process and metal working fluids, and more. This product may be introduced to formulations at virtually any step of production. 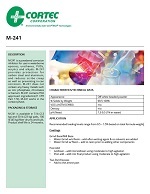 M-241 does not contain toxic components and has FDA approval (21 CFR part 172). Designed for easy blending into the production process without unnecessary risks to personnel, equipment or other manufacturing compounds. Package: M-241 is available in 50 lbs (23 kg), 100 lbs 45 kg), fiber drums and bulk.